Hi! 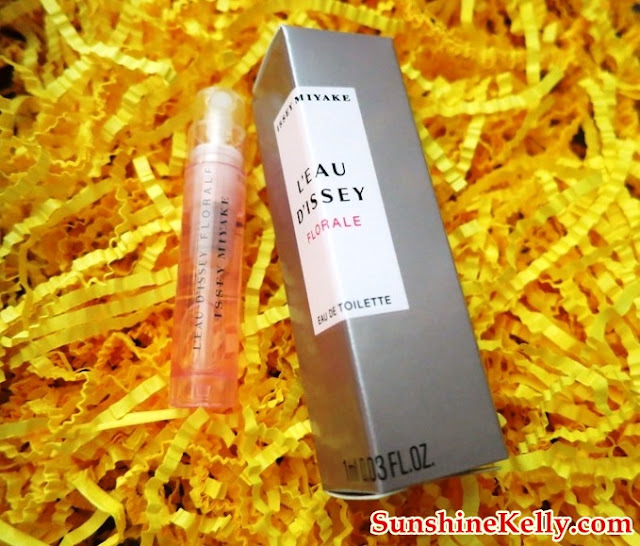 This is my Vanity Trove April 2013 Beauty Box themed The Shower of Summer. 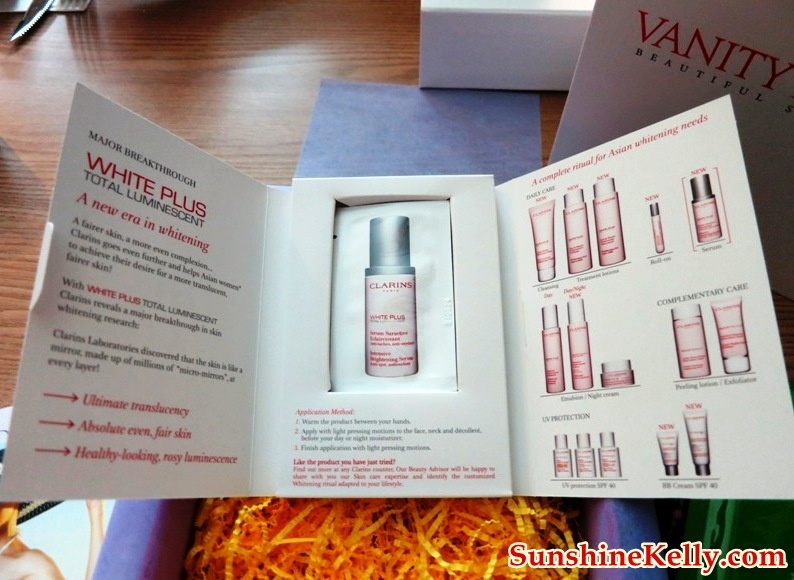 Well, Vanity Trove is the only beauty box with regional presence in Malaysia, Singapore, Thailand, Indonesia and Taiwan. This is the 3rd edition of Vanity Trove in Malaysia. With the local team formed, services are now more personal and affordable. From now onwards Vanity Trove Beauty Box is RM50 only with the same or even better quality and varieties. Wootz! 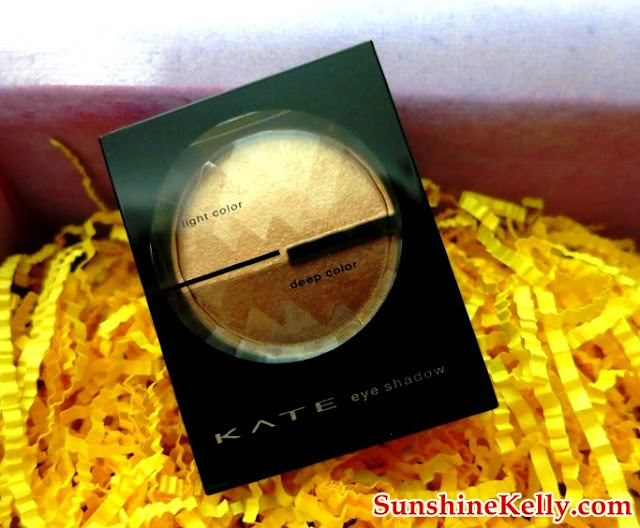 This Kate Eyeshadow is actual size not sample size. I got #BR-3 in two shades that can be used individually or mixed. The deep color is like brown and the light color / highlighter is gold. Brown tone is more natural and it’s an easy going and safe color means I can use it on daily basis. Kate EyeShadow DB is available in 8 different hues. I got this sparkling blue with gold dots on the tip. This too is actual size. Like it! Because it bling-bling and this nail wrap is so convenient. I don’t have to spent so much time to paint my nails for a few layers, do nail arts and wait for it to dry. With this Perkins Nail Wrap I just need a few quick steps. Select the size that fits your nail, if its too long you can cut accordingly. Stick it on near (not on) cuticle and smooth it. Fold down, press firmly and file the excess. Apply a top coat on surface and tip to have better protection. PERKINS Nail Wrap retail at RM39.90 for 20 strips. Available in 21 glamorous designs uniquely made in Korea. This KilaDoll Licorice & Job's Tear Whitening Mask is also suitable for sensitive skin user. Its not only for whitening purposes but also moisturizing. I like the supple feeling. 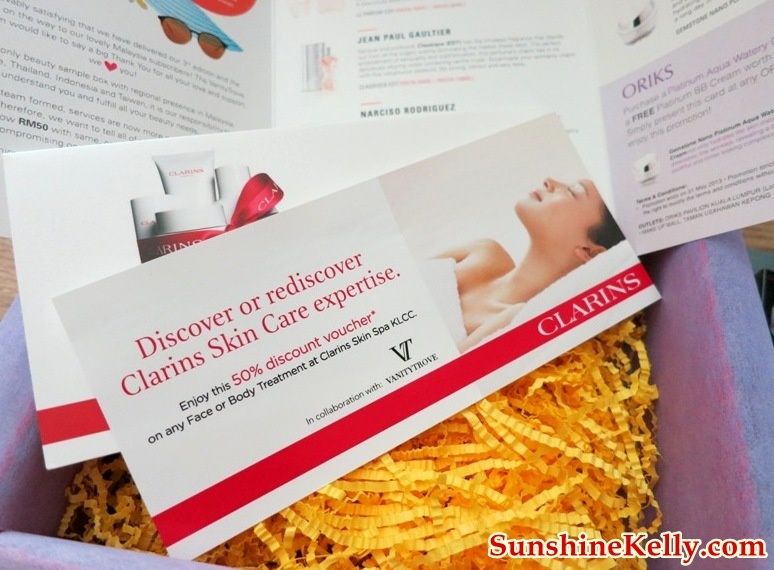 CLARINS products always have very good scent, its natural scent. These sachets are great for my travelling usage. I use it every night, when I woke up my skin looks fresh and radiant. This is a moisturizer helps to reduce wrinkles, lightens pores and brightens complexion. Contains more than 90 types of natural minerals to boost skin vitality and protect our skin from harsh environmental stressors. The texture is off white and thick cream type. I only use this at night because it is quite thick and rich. The packaging is good in a way that it control the amount of cream we use each application. The scent is mild sweet fruity. I feel that my skin is moist the next day. This cream is developed in France and Made in Korea. ORIKS Gemstone Nano Platinum Aqua Watery Cream retail at RM398 for 50g. Love the light sweet floral and feminine scent. This is good to have it in my handbag. So you what do you think of this month Vanity Trove Beauty Box? Overall, Vanity Trove Apr Edition 2013 is better and yes I like it. Ok, this month beauty surprises are better in terms of the product mix and the sizes. Plus Vanity Trove Beauty Box is now at RM50 only with the same or even better quality and varieties. Good work and keep it up… would love to peep on Vanity Trove May Edition. eeee i like ur perfume!!! i know, i know... i swap w you lar. me too. its better than march.